Adjoining neighbours can sometimes get into a dispute about the position and ownership of a particular boundary, be it a fence, wall, barrier or some other kind of boundary line. Often the Boundary Disputes will arise when one party wishes to use part of the land for something particular and the adjoining neighbour opposes that on the grounds that the other is encroaching upon their land. Alternatively, arguments also arise where damage has been done to a particular fence or wall, for example, which then needs repair and the decision over who is going to foot the bill. Usually, the most common way of establishing boundary lines is to check the deeds of the properties involved and, more often than not, there will be a clear demarcation of exactly where the boundaries are. However, this is not a foolproof method as previous owners of the houses concerned may have agreed to alter the boundaries for one reason or another yet have not informed the Land Registry. Another point to consider is where one party has been using the disputed area of land continuously for the past 12 years. This is something that is termed as 'adverse possession'. It can be quite complex to understand and in this situation, it's better to seek legal advice if the dispute cannot be resolved amicably. There are certain boundary areas that will not be included within the deeds, such as party walls, hedges and ditches and fences. Most of the time it's simply presumption that determines who owns what and whose responsibility it is to maintain certain boundaries or barriers. If you can't agree the boundary line, there are steps that you can take to determine the boundary (see below). Disputes over boundaries and your rights can run into several thousand pounds and even six figure sums in more complex cases should you decide to take the matter to court. This can cause immense stress. The best way to resolve any boundary issues is to try to reach an agreement between both parties. Once an agreement is reached, you can inform the Land Registry of the agreement and fix the boundary. However this comes at a cost, and it may be that you and your neighbour can resolve the issue without needing to formally "fix" the boundary line. In mediation, an independent person is jointly appointed by both parties to "police" discussions. It is very much up to the two sides to reach an agreement. Having someone to help ensure that discussion stays on relevant issues can help with this, but both parties need to approach the discussions with a genuine intent to resolve the matter and appreciate that this will involve some compromise on both sides. This can be a great and comparatively cheap way to reach an agreement that all parties are happy with. Further, the Courts will often stay (put on hold) proceedings to give parties chance to try to reach a settlement via this method. However the "down side" of mediation is that either party can walk away at any point, and so there is no guarantee that the problem will be resolved. Should you wish to undertake mediation, an RICS accredited mediator (who specialises in boundary disputes) can be found at http://www.ricsfirms.com/accreditations/mediationaccreditationscheme. Adjudication involves both parties jointly appointing an independent expert who will decide the dispute for you. Both parties agree to be bound by the adjudicator's decision. Many barristers chambers offer this service. The advantage of adjudication is that it is speedier than trying to resolve the matter via the courts, and a definite solution will be reached. Further parties will usually not be required to make an appearance in person. The disadvantage is this can be a very expensive option, and in some cases can be more expensive than using the Court system. It can also create further dispute by parties failing to agree an adjudicator, and spending more time arguing over who will resolve the argument than actually working towards a resolution! The Courts are of course available should parties be unable to resolve their dispute amicably. Sometimes this may be the best way of resolving your dispute. However I would advocate careful consideration of the following before applying to the Courts. 1. You will usually need to instruct a solicitor to guide you through the Court processes and assist you to best present your case. Solicitors range from approximately £120ph to over £200ph. You will need a number of hours to allow for consultation with your solicitor, receipt of advice, and preparation of your claim / defence with your solicitor. 2. If you are not successful, there is a risk that you may have to pay at least a portion of the other party's costs, as well as your own. 3. The Courts will usually expect you to have considered and attempted a form of alternative dispute resolution, such as mediation (as discussed above). 4. The Courts often have a several month backlog. When you will be able to have your case heard will depend upon your local court's timetable. However in large city centres, this could be as long as six months, particularly if you have a number of witnesses or a large amount of evidence to be considered. Before taking steps to try to determine a boundary, first consider why you need to determine the boundary. 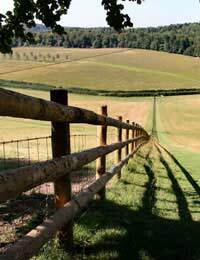 The above options have varying costs, however all do come at a cost, and it may actually be cheaper to for example jointly pay the cost of repairing a fence rather than spend money determining whose responsibility it is to do so, particularly if this is likely to be a one-off repair. Also remember that disputes with neighbours may have to be declared should you wish to sell your house, potentially making your property less attractive to buyers. My parents neighbours have put a 6 ft 6 fence up (12 panels - 3ft width panels long) and painted both sides of the fence red/ orange (on the side facing my parents garden). So my parents get to look at this colour from their side of the garden. We would like to paint my parents side oak brown a more natural colour. The fence has been built on the boundary line with posts sitting on the boundary line between both gardens. Please can you clarify the uk legal position? Many thanks. I want to extend our kitchen at the back of the house roughly 2x3m. To follow on an existing extension of the lounge, thus running the full length of the back of the house. We will be taking the flat roof off the existing extension and have it pitched with the new kitchen extension. Having had a few builders round to quote, they have said they will need the neighbours fence panel down to build the wall. When we moved in in 2000 she accused my children of setting of her burglar alarm, they were aged 4,6,8. and threatened to call the police as my children were unruly according to her. She has also made it clear the fence is hers even though the posts sit on our property by about a brick length. She pushes large stones under her fence into our garden in the summer of which we push them back. She is not the easiest neighbour but we have held the peace. We desperately want the kitchen done but we feel she is going to say know or at the least say yes then change her mind when the build gets underway. How do we stand on this matter. I recently replaced a fence using the same fence line that has been in existence since occupying my property nearly 40 years ago. However, for some reason that I do not understand, my neighbours are accusing me of trespass saying that the fence has been erected on their land. We're talking about 6 inches here so even if they were right they wouldn't be able to do much with it. I've received a nasty letter from their solicitor which is full of lies telling me to move my fence otherwise they'll take legal proceedings. I'm sure they're doing it out of spite because I didn't ask the fence company that they recommended to put up my fence. I've always had a good relationship with all of my previous neighbours and there has been no other dispute over the common boundary that we share. It's all so petty. We live in a new build property andour garage form part of the boundary that sepearates is from the people behind us. The soffits/fascias/guttering to our garage is technically over their garden. Last week I noticed the back of the garage was lit up I just figured that they had put in garden lights, then I noticed electric cables poking up in the garageand upon further inspection it seems that they have cut holes in the soffits/fascias of our garage and wired in spotlights that is linked to their electricity supply. They have not asked us for permisson to do this and I am very concerned that we have someone elses electrical work running in the garage without any fireproofing etc.Can we just remove the cable and lights and cover up the holes in the soffits/fascia? I have a property at the end of a residential close and have a driveway that runs separate and parallel to my immediate neighbour. My neighbour has extended his front porch to the point where it obstructs vehicular access to his own garage and insists on driving across our drive without permission. Since we have taken active measures to prevent him driving across our property, he has become abusive and prone to making constant foundation less petty complaints. In order to provide a separating barrier to remove all ambiguity, I intend to extend my front fence line along my drive to the point where it meets the pavement/walk way. I anticipate resistance from my neighbour so wonder where I stand on the matter? Boundary fence was on my property, my intention was to replace this with new. At the time my neighbour was okay about this, then he told me that he had a rockery on the fence which encroached the boundary. We agreed to get quotes for his side of the removal and then asked me if I was prepared to pay for half the cost of removing his rockery, no was my reply. He has gone ahead with the work on his side but removed three panels and a fence post from my garden and in doing so has dislodged my patio slabs. The cost of the repairs are approximately £3,000 to £4,000, what are my rights. Please advise. My house is a semidetached. Recently, my next door neighbour put a new fences in the back garden from the end of their kitchen extension to the end of their garden. I believe the built has encroached upon my land as the fences are standing 15 inches inside my back garden. 15 inches is the width of the gap from the end of our party wall to the new fences. To make matter worse, the builder who erected those fences damage the guttering on my conservatory. I have spoken in person to the neighbour about the fence and they are adamantthey are in the right and will not do anything about the fences. We bought our house 11 years ago and was told by the neighbour it was a shared drive, as our house had double gates and theirs had a single gate, the previous owner always parked in front of the double gates, which we also started to do. However in the last few weeks we have had builders in replacing our kitchen and this has obviously upset the neighbours Nd they have told us we can no longer park their. Unfortunately there is no way too resolve this with the neighbours, our question is, the boundary line in the title plans show the dotted line leading to the footpath, can we erect a fence to separate the two drives? I built a one meter high wall , after getting verbal agreement with my neighbour, in between our drives. The wall is in accordance to my land registry map . Gave him 3 week’s notice before starting work. Once work was completed he was unhappy but let matters rest. He approached me yesterday asking if he can build a pillar which rests on my wall . Telling me his builders are waiting outside and he needs an answer straight away. I said no - telling him neither of us will be able to make any changes in the future if we need to and he can build his pillar touching my wall. He was very cross - where do I stand ? Hi my neighbour has built fence keeping some gap from original boundaries.There are concrete wall with wire net old fence as a old boundary,the problem is he is keeping all the junk Wooden pieces in the gap that is making my sights looking disgusting I was wondering if he is allowed to do that legally despite the space is belonging to him .Thank you..
After inheriting the house next door the son and daughter started renovating it, puilled down the 25ft leylandi (and my fence), said they'd replace said fence at no cost to me and are now selling the house (a year later) and when I asked when the fence was going up they said they'd changed their minds. They have taken the leylandi down, they did this ages ago, it was dead anyway. I refuse to pay for a fence as they destroyed it. Am I legally obliged to put up a fence or will plants or a ditch suffice. Where do I stand when the house is sold if I get neighbours who say its up to me to put a fence up as its on my side, (my left when I'm in front of the house). Should I let the Estate Agent know of this? Many thanks for any help anyone can ofer. My neighbour has built a brick boundary wall before I moved into my property.The wall is 6ft high and is not fully built on his own land. the brickwork is part on my land which is evident when looking at the party wall line of the rear elevation of the house..The neighbour has told me I cannot touch the wall on my side not even a nail or screw. What are my rights to use the wall on my side, is there anything I can do. Hi if anyone can give me some advise please I purchased my house couple years ago no problem all really nice neighbours but there is a fence separating mine and what was the lady next doors drive, this was never a problem until she has now passed away and her family who do not live round here have sold the house, the people buying the house have already been telling the street they plan on building on the drive, this does not bother me the problem is they believe the fence is in the wrong place and have told me when they buy the house they are having it moved! To give them more room to build! I have now had a slight argument about this because I have looked into it and the fence was originally put up in 1984 when the house was built and because it had been there that many years I don’t care what the os maps say my house and previous owners have maintained the fence and use the drive every day! ( moving it will stop me using my drive it’s already a tight fit) and I should also add it is about 1 foot different to the os map not alot!. Now am I right in telling him no he cannot touch the fence I purchased my house knowing that’s the boundary and he has not even purchased his and can see where the fence is! It does not say in any paper work by land registry that either of us own it just that they should be treated as party walls and maintained so this is what I have done thanks. Talk to your neighbour, ask them why they have encroached on to you property. Perhaps they don't realise they've done it. If you can't come to a mutually acceptable resolution, you could try using a mediator etc. If that is unsuccessful, you may have to consider legal action. The boundary between my property and my neighbours is described as a party wall. So no clear responsibility. There s a brown panel fence with dividing concrete posts between the property's which is decayiong. And seems to be mostly held together by foliage on his side. Infact one panel has so much foliage it is completely curved and looks like it could break. I want to replace the fence. This will inevitably mean reducing some of my neighbours foliage when the fence comes down.As neither of us is separately responsible can I just go ahead and replace or do I need his permission. You should talk to your neighbour before going ahead with this. He may want to take steps to remove if his plants before you pull down the fence if nothing else. Check that neither of you is actually individually responsible for the fence. Your deeds might help with this, or you could ask a boundary specialist. the boundary between my property and my neighbours is described as a party wall. So no clear responsibility. There s a brown panel fence with dividing concrete posts between the property's which is decayiong. And seems to be mostly held together by foliage on his side. Infact one panel has so much foliage it is completely curved and looks like it could break. I want to replace the fence. This will inevitably mean reducing some of my neighbours foliage when the fence comes down. As neither of us is separately responsible can I just go ahead and replace or do I need his permission. In 2014 I replaced the fencing between my garden and the one next door. At the time both houses were owned by a housing association and my neibours were lovely, sadly in 2015 they had to move due to ill health. The house was sold and is now a private residence.I'm May this year I was approached and asked if I would mind if they put 2ft of screening up to assist with a planter which already had trellis attached. I agreed to the 2 ft of screening being put up verbally.This was approx 6ft 6in tall and stood at least 6in above the fence, possibly more. As I had agreed to that small part I decided to let it be even though it was an eye sore.A couple of weeks later I had been out all afternoon to find that the screening had been extended up the garden to the house, a total of another 3 1/2 fence panels, each one at least 6 inches above the fence.It took me several days to pluck up the courage to go round.i was greeted with a "We didn't think you'd mine and he wanted to get on with it"I was taken through to view said 'extention' they had screwed horizontal batons to my fence so they could attach this willow screening. Sadly my response was not what she wanted when I told her she could not attach anything to my fence. This is where neighbourly relations came to an abrupt end, things got a bit heated but I left them in no uncertain terms that I wanted it taken down.They have trimmed it to the hight of the fence but the batons are still attached, they have also moved the planter but attached the trellis to my fence.i contacted my landlord to determine who the boundary belonged too, the contacted the Land Registry Office and there is no determined boundary as the land was bought and then split into plots and can offer no further advice. I saw the husband last night and asked politely when I could expect the rest of the screening to be taken down and for any damages due to screws etc to be put right, I was met with a roll of the eyes and a shake of his head. Does anyone have any advice please? Thanks in advance. Hi my neighbour removed all of his conifer trees and replaced them with a 6 foot high fence. However, he left a chain link fence and metal posts (his boundary line) on our side of the fence, which he refuses to let us remove as he said it’s still his boundary. The state of the chain fence is in a bad way and leaning into our boundary and is very unsightly. What are our and his rights please? Trying again with corrected grammar! Advice needed please. My elderly neighbours (89 and 93 yrs) own, as shown on the deeds, the garden wall between their new neighbours. It’s a terraced property.The new owners want to pull the garden wall down and put in new footings so they can extend their property.It will be rebuilt. They are inclined to object to this as they do not wish the upheaval and the loss of several established plants that are growing up their wall. However, they are also worried as the wall on the new neighbours side is in bad repair and they fear being given a large bill for repointing the whole wall (it’s very long). The pointing on their side is perfect.Can they legally object to the wall being demolished (and rebuilt) and not have to pay for the repairs to it on the new neighbours side? They cannot afford to pay for it to be repointed. Thank you. Advice needed pls. My elderly neighbours (89 and 93 yrs) own, as shown on the deeds, the garden wall between their new neighbours. It’s a terraced property.I live on the other side and I’m trying to help them as they are feeling bullied.Thenew owners want to pull the wall down and put in new footings so they can extend their property. They are inclined to object to this as they do not wish the upheaval and the loss of several established plants that are growing up their wall. However, they are also worried as the wall on the new neighbours side is in bad repair and they fear being given a large bill for reprinting the whole wall. The pointing on their side is perfect.An they legally object to the wall being demolished (and rebuilt) and not have to pay for the repairs to it in the new neighbours side? They cannot afford any expense. Thank you. You will need to check your title deeds to see if there is any mention of the wall/boundary. If not, perhaps a boundary specialist/surveyor might be able to help.